can wider tires fit on this bike? Last edited by rumrunn6; 01-22-17 at 07:12 PM. Yes, but your fender clearance will decrease. 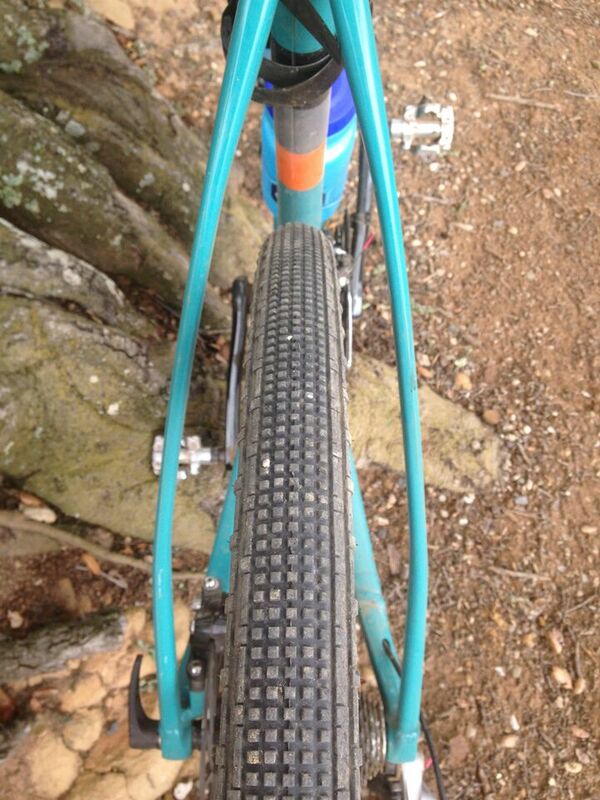 Presuming the tires won't ride the chainstays...which 40mm is pushing basically all CX bike clearance. Otherwise 650B might be in order. Last edited by rumrunn6; 01-22-17 at 11:54 AM. 1.5" wide in a bike like that is already pretty wide, 42 is about the limit, live with it. until you buy a 29er frame /fork/bike.. If you don't need the knobbies, you can run a tire with less tread and a larger casing for a plusher ride, and still keep clearance. Macro shot, it's a thicker thread look but not so deep in reality. I doubt a 622-50 will fit, but throw the dice and give it a shot. Slant Six 2.1 would probably fit, as they reportedly run about 1.8" actual. Thing is you need to find one you could try on. Some shops have piles of removed tires. 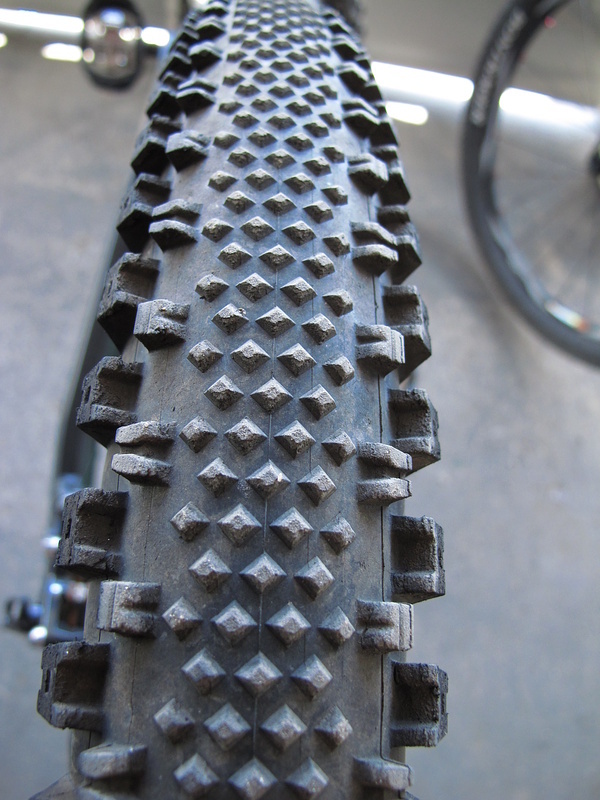 hey how about a 700x55 "cruiser" tire? Almost certainly not, if it's actually 55mm wide. And if it does, I hope you're both attentive and handy with a spoke wrench. I'll bite, why a spoke wrench? if it fits at all ..
Bob nailed it. I've done the "practically-zero-clearance" thing before, but only on bikes that are used on road, in good conditions. Eventually it gets old, though, messing around to keep it running perfectly straight. Oh, by the way, bear in mind that most tire casings are *not* perfectly true, so to make it fit, you may need to intentionally make the rim out of true. Not worth the headache, in my opinion...keep at least 3-4mm clearance on either side of the tire--even then, that's on the real tight side of things. To add to the discourse here a little bit, there are slightly wider 700c tires available--Compass Snoqualmie Pass (44), Panaracer Fire Cross (45), and Contental CrossRide/SpeedRide (ostensibly 42, but really more like 40) immediately come to mind, and look like they might fit your frame, but I would also pose a question to you: is a few more millimeters worth spending $90-120 to you? Last edited by wschruba; 01-23-17 at 04:06 PM. photo 1 looks like your missing a spoke on the front wheel. is a few more millimeters worth spending $90-120 to you? Last edited by rumrunn6; 01-23-17 at 07:11 PM. Last edited by rumrunn6; 01-23-17 at 07:07 PM. You guys are throwing some good tires choices. Here's one I got in a trade and really like it. Comes in 32, 35, 37. Add Continental Speed Rides to the tires rumrunn6 suggested. Excellent all rounder 700x42 tires (nominal, actually closer to 38 wide) for pavement and modest trails. I run 'em soft for rough roads, around 50 psi, and up to 60-65 psi for better pavement. Very easy on my damaged neck and back with my rigid fork mountain bike. I tried three sets of most-terrain tires before settling on the Conti Speed Rides and plan to wear 'em out and get 'em again. I thought about trying wider tires too for a cushy ride. No problem with the frame, but the front derailer cable clamp bolt would rub with anything wider. Only way I could run wider tires with this mountain bike is to convert it to a double chain ring or possibly a single. Unfortunately the 700x42 tires are too wide for the SKS fenders that came with the bike, but I may get some quick attach/detach splash guards for this bike and save the SKS fenders for a more general purpose bike. Another reason I probably won't add regular fenders to the mountain bike is a few times riding off road I've snagged some debris -- small fallen tree limbs, large bits of dried brush with tough stems -- that might have tangled a fender and tossed me overboard. That is downright cheap for WTB tires!! FYI, that size of Gravel King SK measures a bit WIDER than nominal. They measured 42.5 mm wide on my girlfriend's cross bike, which has pretty standard 19 mm wide rims. They're a great tire, wide, fast, and decent grip.